"Intelligence tests conducted on the elephant reveal that it exceeds all other herbivores and possesses remarkable powers of learning." In the early sixties Lahugala was active with timber-cutters. The contractor had a ‘wadiya' by the road, close to the circuit bungalow. One day when I visited, one working elephant was in must and had become dangerous. 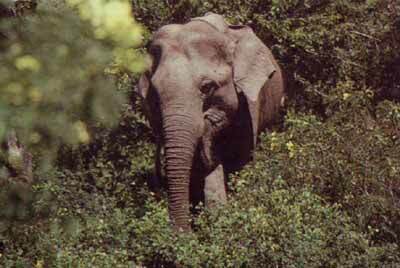 The animal, with its already chained hind legs securely tethered to a nearby tree, was visibly restless, constantly moving trunk and front legs. As the mahout approached with the henduwa (goad) and pricked an ear, ordering it to be calm, the animal suddenly became quiet and appeared docile in meek obedience. The keeper reassured, untied it from the tree and led the animal, still with rear legs chained together, to the Heda Oya behind for a bath. Once there, believing that the animal was quite obedient now and hence under control, the keeper decided to remove the chain from one leg. Then, pricking with the henduwa again he went under the trunk to cross over to the other side. Just then, the animal quietly grabbed the man with the trunk and flung him into the air. As he landed, he was trampled to death and, trumpeting wildly the animal crashed into the jungle. The search began, with other working elephants joining in, and the Police was also called. The animal was finally found trapped, by the bit of chain on its leg entangled to a fallen tree. As the men and beasts moved in, the infuriated animal broke loose and charged. It took the misaimed shot, veered, and started, running on the road towards Pottuvil. As the mad animal caught him, the pregnant woman, utterly hysterical now, rushed to the animal and entwined her arms round its trunk, to save her husband. What followed was incredible and unbelievable. Calmly and thoughtfully, the pachyderm very gently, but firmly, pushed the screaming woman aside, without harming her; then trumpeting again, killed the man, before police reinforcements approaching from the direction of the town felled it down. The second incident took place at Yala before the new bungalow by the Menik Ganga came up. In the open verandah of the old rest, before it was damaged by floods, I was seated with some friends one evening, watching the river in spate flowing fast and dusk rapidly creeping in. Suddenly the stillness was rent by loud trumpeting from the other side, a little distance away from the bungalow. Fifteen minutes later, there was trumpeting again and two adults came out, with the second one's trunk gripping the tail of the first, and, followed by the calf in the middle holding the tail of the second, with its own tail being held by the third's trunk, whose tail in turn was grabbed by the fourth, behind. We sat spellbound as this majestic formation, slowly but surely, gently prodding the calf, crossed the torrent safely to the other shore. D.A. 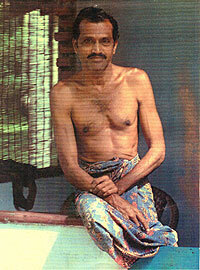 Tennekoon of Ratnapura was a much respected squire who lived in his old walauwa and had many elephants in his stable. His nephew once narrated this third tale about elephant intelligence. It appears that one day, his elephant keeper experienced much trouble to take the tusker for the customary bath after the day's work. 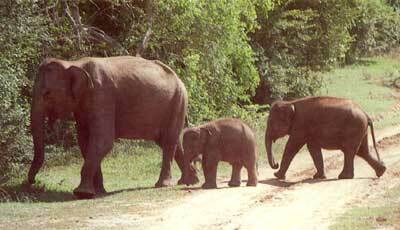 Even during work that day, the animal often disobeyed the orders of the mahout and avoided all hard labour. After the bath the tusker was daily led to the presence of the master, who spoke to it in the elephant lingo and patted the animal, before it retired for the day. That evening bringing the elephant to the master, the keeper complained about the animal's behaviour. As the owner touched the neck, he knew at once that something was wrong; the body temperature was very hot to his touch. He addressed the animal softly. The tusker immediately took his hand with its trunk and inserted it into its mouth. The master felt the jaw red-hot, tender and inflamed. On closer inspection, he saw, deeply embedded in the gums, a wood splinter making a nasty, festering wound! Gently, he pulled out the splinter and the animal responded gratefully, caressing the owner with its trunk. See also: "Elephants in Sri Lankan History and Culture"